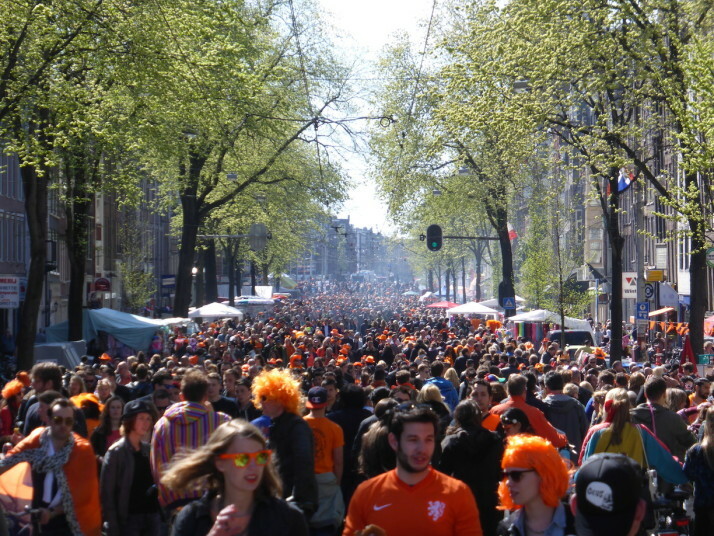 Our penultimate day in Amsterdam was the 27th of April, which is the Dutch National Holiday called Koningsdag or King’s Day and marks a day of public celebration for the King’s birthday. The centre of Amsterdam is closed to traffic and trams, and almost all of the locals swap their bicycles for orange clothes – it’s bright, fun, crowded and noisy – we loved it! Why orange? Because King Willem-Alexander of the Netherlands and the Dutch Royal family is of the House of Orange-Nassau! 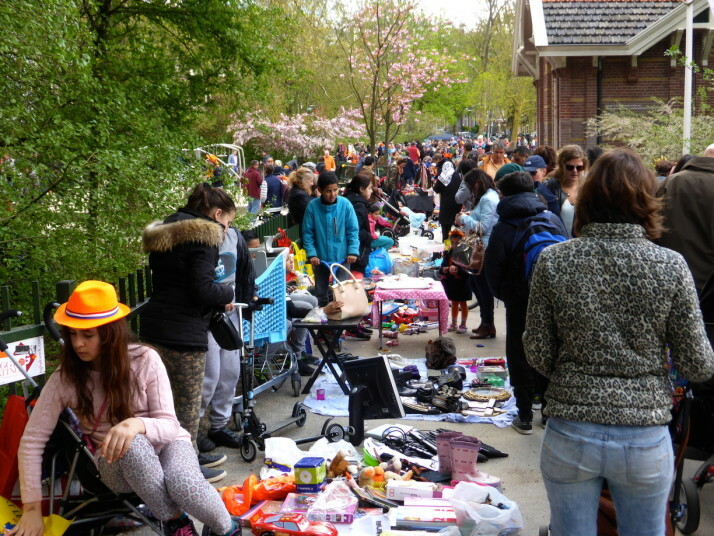 We started with the nearby Sarphatipark, which was full of entrepreneurial kids running all manner of car-boot-like jumble-sale stands, orange tarpaulins strewn with used toys and worn clothes, others with homemade cakes and some really inventive ones like a whack-an-orange, living statues and the Human Fruit Machine.. from what we discern the latter involved three kids with their heads in cardboard boxes, that each held up a piece of fruit after you paid them! The busy Sarphatipark, full of locals with their kids enjoying the sunshine and the atmosphere. Selling their unwanted belongings was definitely secondary! We loved the inventiveness and thought that had gone into some of the wackier stalls, not to mention the bright orange cupcakes! 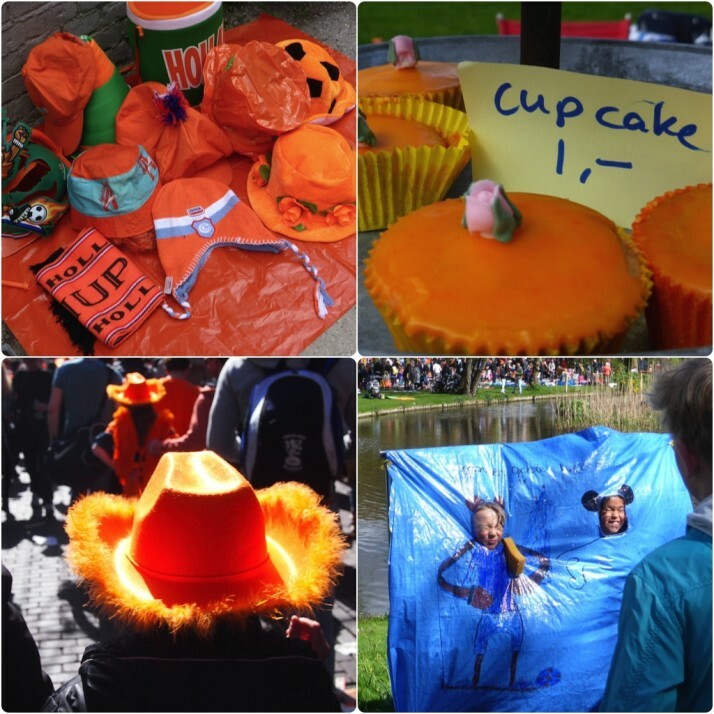 Clockwise from top-left: The first stall we saw in Sarphatipark – get kitted out if you aren’t already! ; Those homemade bright orange cupcakes, yum! ; Throw a wet sponge at other people’s kids – I imagine that’s easily their parents favourite game of the day! ; Fantastic orange headgear like this furry-edged Stetson! There are some restrictions on what people can sell, anything with meat in it must be from a licensed restaurant to avoid upset stomachs, and alcohol can only be sold from licensed premises though we never had to walk more than a few steps to find a beer! 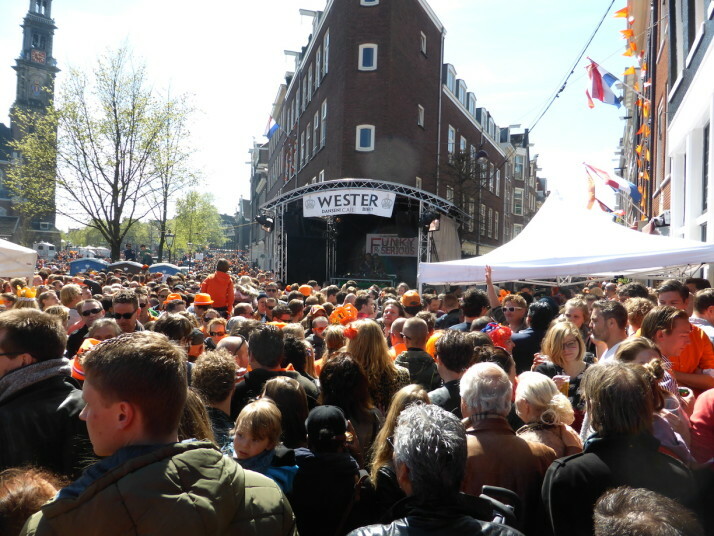 Loud music is everywhere from buskers, residents pointing their stereos into the street, and proper public stages with massive stacks of speakers – it must be easy to find work as a DJ in the Netherlands on King’s Day! As we walked through the streets from square to square, and canal to canal, the soundtrack to the day was eclectic – electronic dance was the most common from the bars and large public music stages, but walking past people’s houses we heard jazz, 80’s pop, reggae, classical, funk, and even a Christmas tune! King’s Day boat drinks. I used the ‘Spot Colour’ feature of my camera to pick out the orange and I really liked the results! 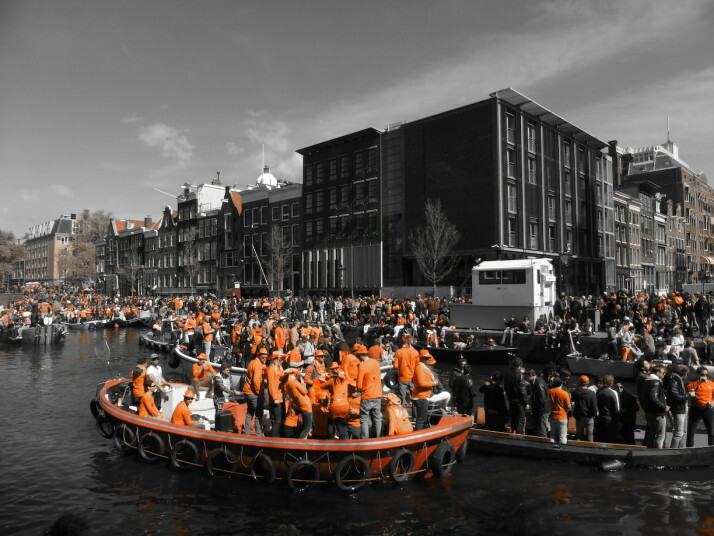 There’s also a one-way system in force on some of the canals because long-boat parties are the place to be seen on King’s Day in Amsterdam. Each one had a bar, a DJ, a shower-curtain hoop toilet and a lively complement who remembered to duck under all of the low bridges! Celebrating with the locals and tourists alike was the perfect farewell to one of our favourite cities of the trip, Bedankt, Amsterdam! 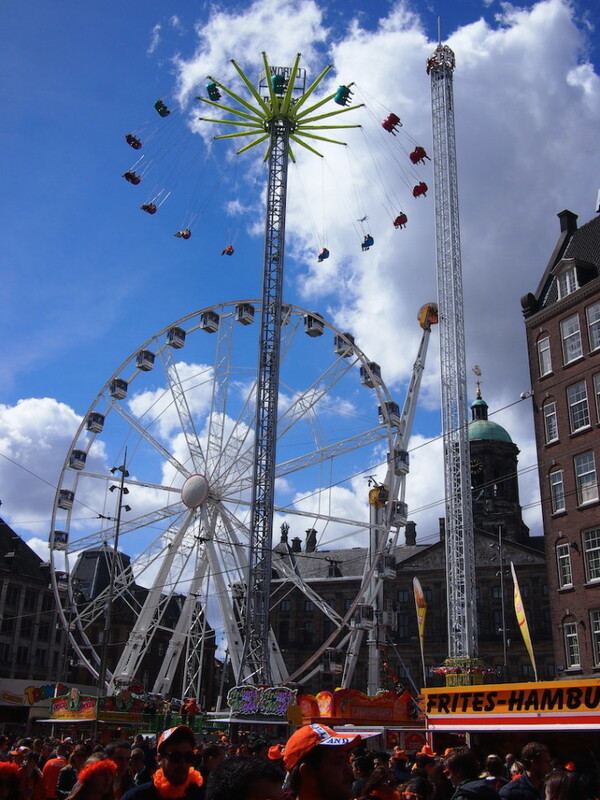 This entry was posted in Experiences, Places and tagged Amsterdam, Netherlands, Orange, Park on May 1, 2015 by Andrew. What is 30 + 25 ?